Hello and Happy Hump Day! We have made it half way so that's a Yay! Hope your week has been fabulous so far! 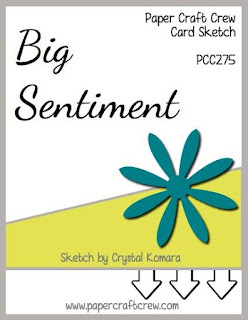 I'm over with my friends at the Paper Craft Crew this week and we have a super cute sketch challenge brought to us by Crystal Komara! I love cards that have angled layers! I knew I wanted to make a coffee themed card. My good friend and former co-worker, Joey Alarid is moving to California and I am making him some cards for him to take with him. He has been my coffee-drinking buddy for a little over a year now. His office was right across from mine and we bonded over our love for coffee and Starbucks in particular. Joey also loves funny cards so I'm sure he will love this one made with some new Cas-ual Fridays Coffee Talk Stamp Set and Coffee Cup Fri-dies. I hope you love it as much as I do.! I think it's so super cute! My Cardstock base was 110# Neenah Classic Crest Solar White and other cardstock used was Stampin' Up! Early Espresso, Basic Gray and Soft Sky. The fabulous Designer Series Paper is Stampin' Up! Coffee Break. I added a little Natural Twine around the cup handle and a few flicks of FSJ Dark Roast Silk to finish this off. The stamp that I used on the die-cut cup is also from Cas-ual Friday Stamps and is called Cup of Coffee. GIU Blog Hop - Welcome To The Hood! Growing in Unity Week Winners!